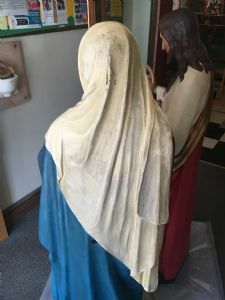 Artefact and statue cleaning and restoration, during mid-June and early July 2018, while the brick work was being cleaned it provided an opportunity to also clean and restore the statues and artefacts in the church. 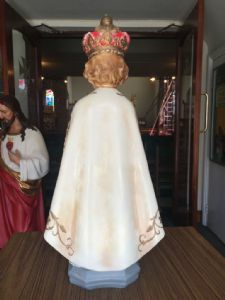 These statues had over the years accumulated a light film or coating of dust and were covered in candle smoke from past years of lighting candles. As of 6th July, 2018 Marc Bernard and his colleague had almost finished cleaning the majority of the interior brick work in the church. 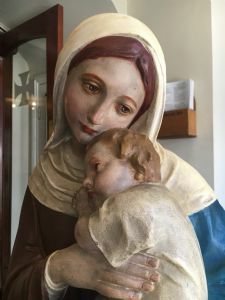 At this point Mary McElhone also started working hard on cleaning all the statues in the church. 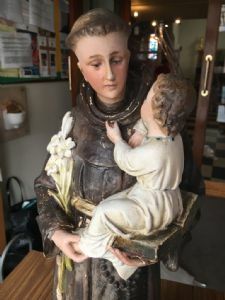 To see how the work on cleaning the statues is progressing please scroll down. 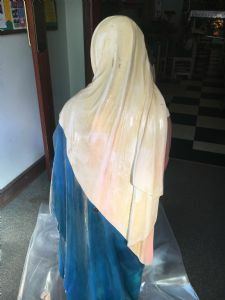 Please see below, this is how the Madonna statue looked like prior to being cleaned. 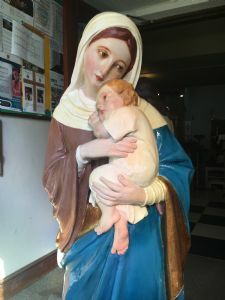 And this is how the Madonna statue now appears, this statue is sited at the rear of the church in the small side chapel. 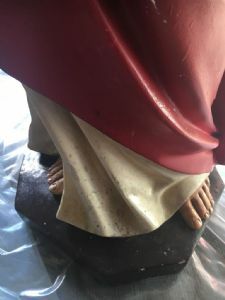 Cleaning was also undertaken on the Sacred Heart statue, here are some views of the before and after stages in the cleaning process. 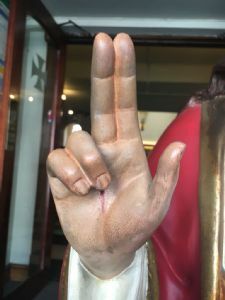 There is a marked difference in the statue, both in terms of clarity of detail and the condition of the paintwork. 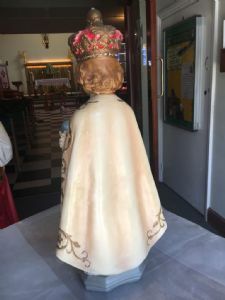 Cleaning was also carried out on the statue known as 'The Infant Jesus of Prague', or 'Child of Prague'. Volunteer(s) cleaning the artefacts in the church are taking great care when carrying out the cleaning process, as some artifacts are both aged and delicate. 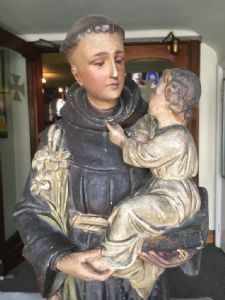 As an example of this duty of care, it took five hours to clean both the Sacred Heart and Infant of Prague statues. 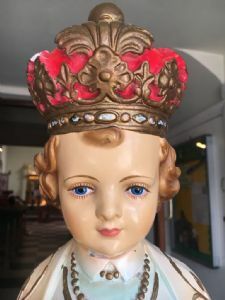 If you wish to know more about the Infant of Prague or Infant Jesus please click here. And here are the rear views of the statue. 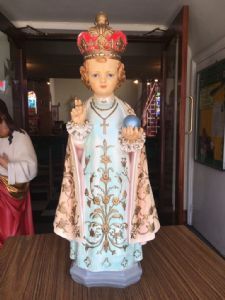 Further information on some of the artefacts and statues in the church can be found on the Parish Tour webpage please click here for more details. 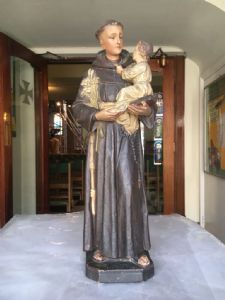 The statue of St. Anthony of Padua also underwent a cleaning process that took around two and a half hours to complete, for just this one statue. 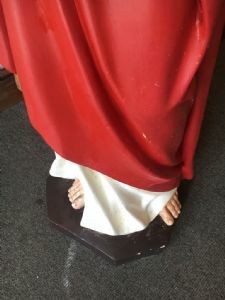 The photographs below show the statue in the uncleaned state. Following the extensive two and a half hours of cleaning the statue now appears as seen below. 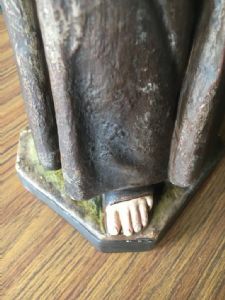 The close up details of the foot of the statue better evidence the before and after cleaning look. 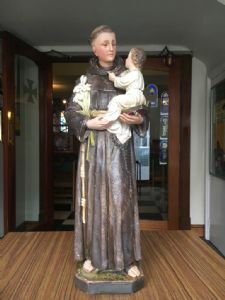 The following photographs below show St. Anthony of Padua after cleaning. 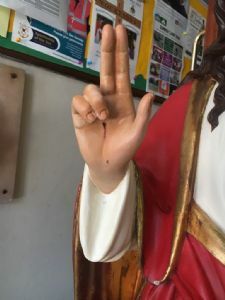 The statues that have been cleaned and now situated around the church appear very different, many more colours and details are evident upon close inspection and sustained viewing. 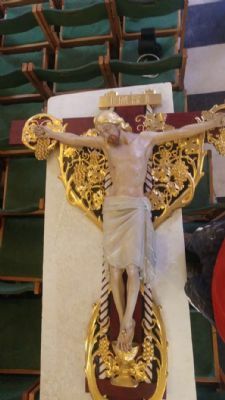 The sanctuary holds an example of a fine comperesque crucifix. This is a beautiful 19th century carved crucifix, which was taken down and has undergone many hours of cleaning and restoration. 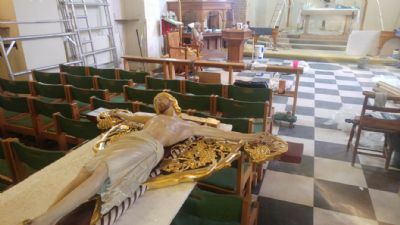 The cleaned and restored crucifix can be seen in the photographs below. many more details are now visible. Thank you to the volunteers for all their diligent and continued hard work.